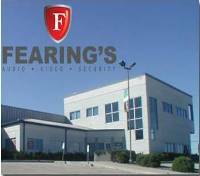 Fearing's Audio Video Security is a design-build Low Voltage Systems Integrator with our core disciplines in Audio, Video, Security, and Voice/Data Cabling Systems serving the commercial, education, healthcare, and government marketplace since 1997. Fearing?s is a true partner in tailoring professional low voltage solutions that meet your unique circumstances. Whether new construction or upgrading an existing facility, Fearing?s excels in providing detailed assessment, design, project management, installation, and service after the sale.